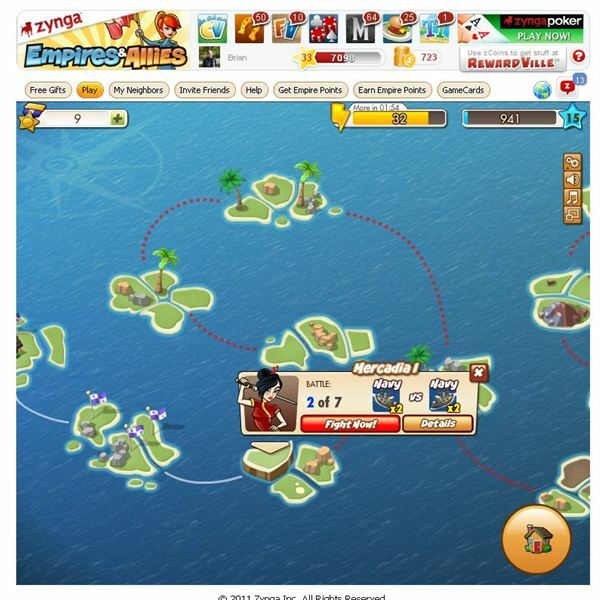 Leading Facebook game developer Zynga is back with another game, a strategy warfare game called Empires and Allies. In the game, you’re on an island trying to rebuild your empire from destruction by the evil Dark Alliance. 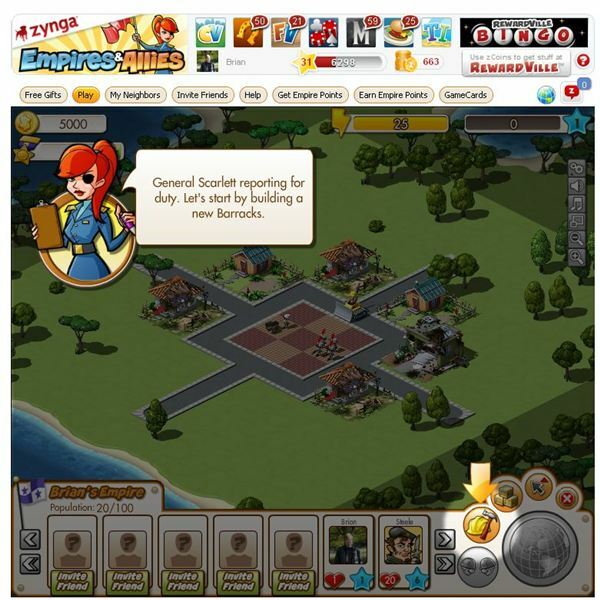 The game play is like CityVille but for the first time, Zynga has added a very significant combat element to the game. Players build up their city with homes, industry, government buildings, and military structures such as a barracks or shipyard. Industries building produce food, wood, oil, and ore, which you use to construct military units to defend your island nation. The game features a campaign where you put your forces up against numerous AI controlled characters and attempt to defeat them with your army. During some of the battles, you can call up an ally to help you. Combat involves air, land, and naval units with split screen style format. The game has a large PvP element too where if you wish you can invade your friends and they can do the same to you. If you don’t wish to fight in PvP, an embassy provides protection from attacks. You can add more protection time to your embassy by having Facebook friends join the embassy. As you build your empire back, you can expand with liberty bonds and own other islands. In addition, the game features the energy system used to perform tasks such as collecting coins or resources. In the game, you have residences which increase your coins output and expand your population. To raise your population limits, use government buildings such as the parliament building or spy agency. There’s no businesses in the game instead you have industry building such as farms, lumber mills, oil platforms and ore mines. The game features wide selection of different decorations such as trees, roads, shrubs, statues, parks and other items. If you want, you can even build walls and watchtowers and make your cities more like self-contained bases. There’s even neat looking guard shacks in the game. While there’s plenty of city building elements to the game the focus this time is on building military units and combat. The game features land, air and naval units. You’ll build the barracks, shipyard and hanger buildings to unlock these features. There are three levels of units so you’ll start with basic infantry and then move up to more advanced versions with a level II barracks, which you can get after raising your population levels. There’s a center square to display your units or you can place them near buildings or move them around your known map area. As you progress in the game campaign, you’ll unlock new military units such as grunt soldiers or field artillery. You can build multiple military structures to increase your output of units. The campaign map features various islands with a campaign NPC character. You’ll fight each character in a series of attacks until you defeat them and move onto the next round. You’ll select a few units and sometimes call upon a Facebook friend to help you. Each unit is good against one unit but weak against another so for example; soldiers are good against artillery but die to tanks. This adds a bit of strategy to the game but combat is very basic which will allow most players to pick it up with ease. The game has decent graphics, which are on par with CityVille and the soundtrack is nice but a bit plain with just some drums. The game has a little bulldozer that runs around as you build or collect items. The military units look good and there are some extras such as the drawn sword on the man behind the artillery piece or the weapons at the ready on the infantry units. 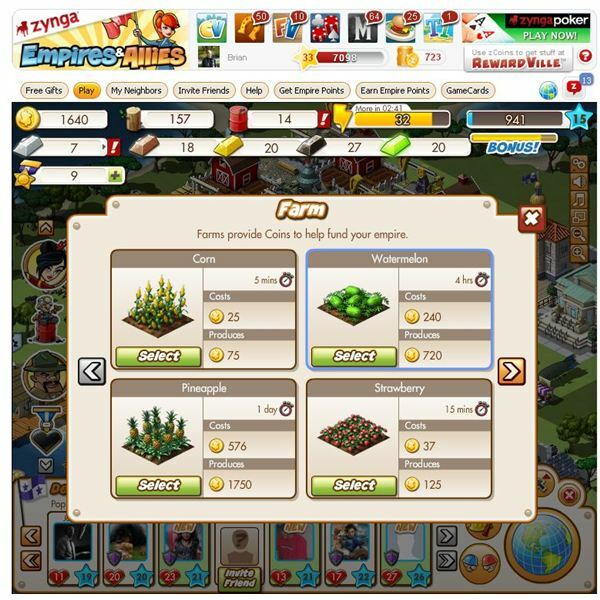 Zynga is going in the right direct with the look of their games; they are surpassing Farmville in that department. One of the nice parts about this game is that the multiplayer options are getting better. You can still visit friends in the game, perform tasks, and get rewards. The typical gift giving is also present but now you have more options to your game play such as choosing to invade your Facebook friends with your army. If you choose this option, you’ll earn infamy and get offensive power-ups as your reward. If you choose just to help your friends and not attack, you’ll earn defensive powerups to help protect your empire against invasion. If you are visiting a friend and someone is attacking them, you have the option of joining in the battle and defeating the invading army. Build an embassy building if you don’t want to participate in PvP, have friends join your embassy to add more time onto the structure, and you’ll keep invaders out. This game is still a city builder but the new combat elements make it a winner and Zynga’s best game to date. The ability to invade and have more interactions with Facebook friends is a welcome change. With more content such as units and new maps to fight on this game could be a very popular title on Facebook. After this Zynga Empires and Allies review, I can say that the game is well worth playing. All images from Empires and Allies. Source: Article is author's own experiences playing Empire and Allies on Facebook.